On Monday, July 28, 2014, as I was walking into work, two managers met me at the door. They hustled me into a conference room and told me that my friend in our group died over the weekend. Everyone knew we were work friends, and the managers didn’t want me to go into work and hear about his death from someone else. I could have gone home but I decided to wait out the day. Often you have personal friends who are like you in fundamental ways. They share your views of the world. Sometimes they share your avocations. Sometimes they are in the same stage of life as you. Personal friends often have similar life experiences. Work friends can be different. My work friend grew up here, like me. I left the area as soon as I could. Even at a young age, I knew I could not have the life I wanted, if I stayed, for many reasons which I will not go into here. I went away to college, and worked here summers. After graduation I lived in various places – Austin, Texas and California are the ones that count, the places in the world that feel like home. I moved back to Pennsylvania in 2009 for my elderly parents. I am still here. I live in the home I inherited from my parents, that I own with my sister. My work friend grew up here, like me, and after a stint in the coast guard (so not me) he never left. He built his house not far from his parents. And by built, I mean built. He had the foundation done and the plumbing, but almost everything else he did himself, with his dad and (I believe) some friends. He was an avid boater. He built a new garage to hold his most recent boat, a garage with water, electricity and some insulation – so beautiful it looked like a little house. “In law unit”, we joked. He had a million friends in the area. He knew his neighbors; they were friendly and they socialized, particularly in summer. I guess when you build your house on a little mountain, in an area with a lot of trees and lots of property maintenance, people get to know each other. He was married, no kids. 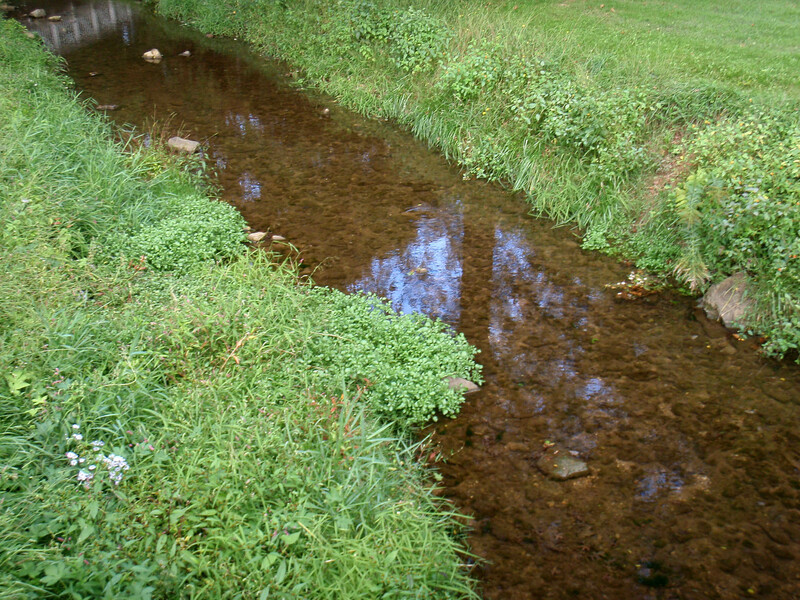 He loved the outdoor work of maintaining his property, getting rid of dead trees, making it nice. I’m reasonably sure his politics were not my politics, but we never talked about it. He loved summer – on that we were in agreement. He loved tropical vacations by the ocean. He was younger than me, but not a kid, middle aged. We started work here in the same group, almost two years ago. We went through all the reorganizations that happened here. We are on our third manger. My friend helped me get through hard times; he was there for me. Currently, he was going through some hard times himself and I was there for him. On work stuff, we agreed on some things and disagreed on others, but we always worked it out. In our latest work set up, he was in a workspace next to me. I said hello to him every morning and goodbye every evening. 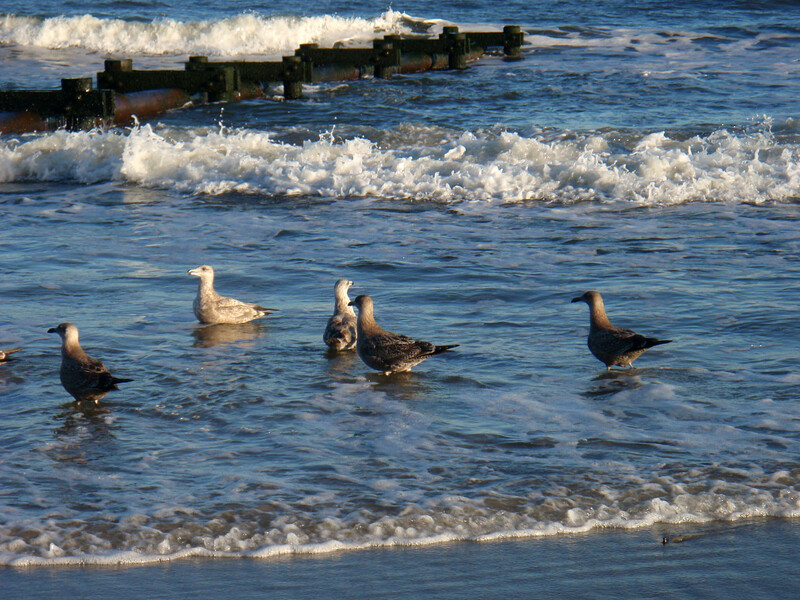 He was an early birder – I drag myself in as late as you can reasonably come in around here – 8 amish. He brought in treats – he loved sweets. I brought us cashews. He was the nicest man I ever met. He was good at dealing with people, colleagues, internal customers, vendors. Everyone liked him. In a different life I would have never known him. Aside from growing up here, and being the same race and (generally) class, and having some similar experiences growing up, we were different. We would have never socialized, never become friends. But that is what happens at work. You become friends. I will try to remember to hook up the trickle charger he gave me. Because, in case you do not know (he told me), I will get more for my dad’s car if I can start it. My dad’s car has been sitting in my garage for over a year, and odds are good it will not start. My friend wanted me to get a good price for my dad’s car. After I get the car started, I am supposed to put a little new gas in it – old gas gets thick and sluggish? I do not know. Brian, I will miss you. 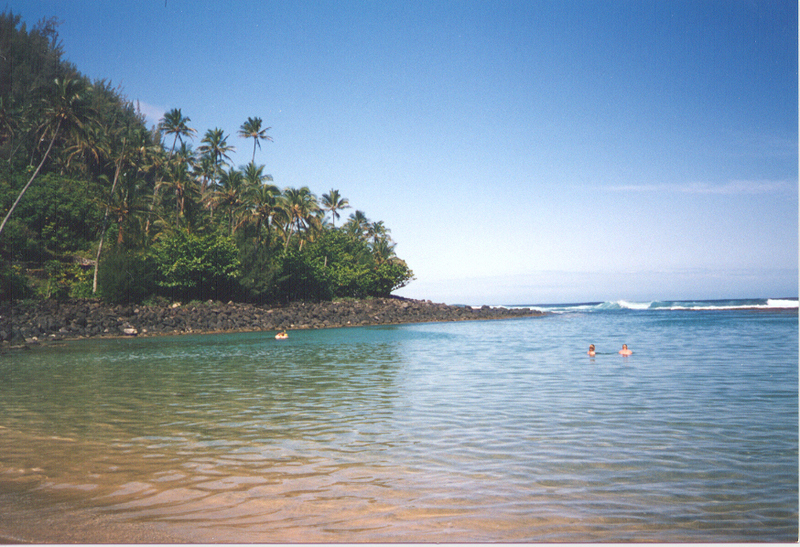 Kauai Beach, not sure of the name. Taken late 1999s. Posted in honor of Brian, who loved tropical vacations by the ocean. I make jewelry as a hobby, some bead stringing, a bit of knotting, some wire work. On an internet forum I’m on, we talked about Pandora Jewelry. Pandora is known for their bracelets. The most popular bracelets have a sterling silver base, a fat chain. You buy glass beads, metal beads, enamel beads and charms to add to the bracelet. There are a multitude of charms designed to commemorate moments in your life, getting a degree, getting married, learning a sport – that sort of thing. The product is nicely designed and good quality. The glass beads have an art glass appeal; they look like Murano glass beads. Everything in the product line fits, both from a design and a construction perspective. And you can buy the bracelets everywhere, in Pandora specialty shops and department stores (in the US), online. I am not going to link to the product as I’m not interested in Pandora jewelry links coming from my site. The links are easy to find, if you are not sure what Pandora bracelets look like. I like the product, somewhat – but there is something about the product that makes me uncomfortable. When I look at Pandora jewelry I think – damn, what an amazing business plan, marketing plan, their pricing. The supply chain works beautifully. And there is something about the pieces that make you want to stay in Pandora’s world. What is going on? Pandora jewelry is designed to keep you in the Pandora world. You are never done. You can start small, a bracelet, a bead or two, a charm, and add to it. New beads and charms come out, periodically, that you can buy to celebrate the events in your life. Marking your life moments with a charm (in my opinion, a too obvious charm) is appealing. People like to commemorate events in their lives. You can take beads and charms off and add new ones (I think you can, I don’t have any Pandora jewelry). Your friends and family can give you a new bead or charm – you can buy them everywhere. The design is such that everything goes with everything. The design is recognizable. You can look at a Pandora bracelet from across the room, and you can recognize the Pandora of it – brand is big with them. From a design perspective, I don’t like the metal on the glass beads, but this is another opportunity for branding; the word Pandora is on the metal surrounding the bead hole. What it feels like to me, more than anything – an Apple consumer product – iPhone, iPod, iPad, iTunes. Everything Apple is deliberately designed, and designed to work together. Life is good for you if you never stray from the Apple space. And you are never done with Apple – you can upgrade your device (not exactly like Pandora) and get something else on iTunes. Your friends and family can give you an ITunes thing. This is not a perfect comparison because so many of ITunes things are thought to be cheap enough that you buy them yourself. People are also not sentimental about an electronic thing the exact same way they are about jewelry. Pandora is like that. It even has something of a proprietary aspect to it, just like Apple! Their beads have an unusually wide hole, to accommodate the fat Pandora chain, so your standard Murano glass beads are not going to fit. This is an imperfect analogy, but you get the idea – though by now, there are bead shops that sell beads that will fit on a Pandora bracelet chain. Pandora jewelry has a sameness to it. This works well from an “everything goes with everything” perspective, but the look borders on sterile, safe. Where are the square glass beads, the oblong beads, the knobby beads? Where are the beads that aren’t all shiny and new? And I don’t think you get much, for what you pay for – but one can say that’s the same for all jewelry, for all consumer products – perhaps for all material goods. You always pay for the brand. If you ever go to a bead show, you realize how much the markup is on jewelry, and I don’t even have a wholesaler’s license. In my ideal world, Pandora bracelets would be the gateway drug for getting people to experience more in the world of jewelry. Go to that craft fair, go to a bead show, haunt the internet for wonderful things. See what else you can put on your bracelet. Hack your bracelet! Until I buy a Pandora bracelet chain to hack – here is a simple bracelet I made, using glass beads I bought from a vendor at the Palo Alto Clay and Glass Festival – recent link – Palo Alto Clay & Glass Festival 2014. I’m not sure of the year, late 1990s to 2000s, maybe. The rust colored sparkly beads are goldstone. The bracelet is strung on sturdy stretchy elastic – designed for jewelry making. 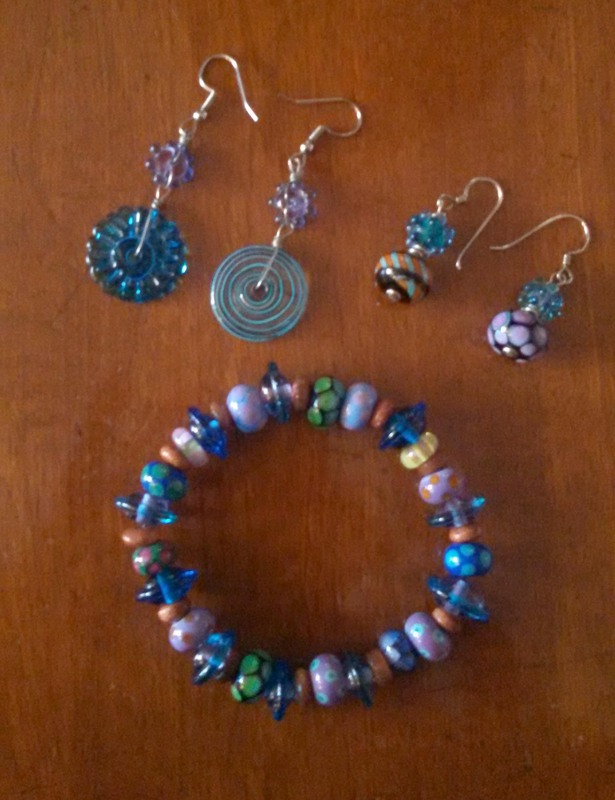 I’m also showing some earrings I made, using glass beads from the same vendor. 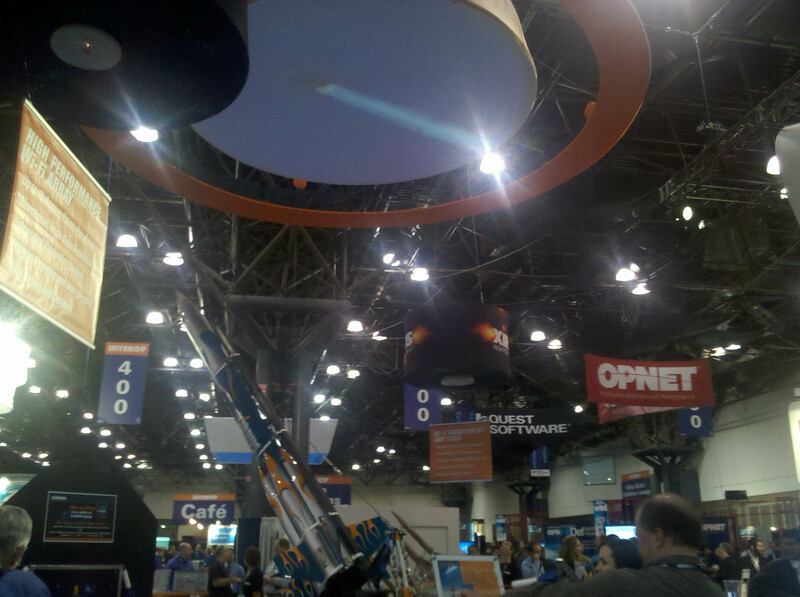 I went to the Interop 2010 conference in New York City, for the day, on Wednesday, October 20th. I’m not Interop material. I’m not someone running a data center or a network, nor am I someone paying the bills for one. I’ve mostly not been on the computer operations side of the fence. Still, I like to keep up. I like to have educated opinions on technology. It’s fun to see what this world is up to. I also hope, one day, to make business decisions about these things. I went to the keynote presentation, with speakers James Whitehurst, President and CEO, Red Hat, Ben Gibson, Vice President Data Center/Virtualization, Cisco, Dirk Gates, Chief Executive Officer and Founder, Xirrus. Aside from getting what the presenters are trying to tell me, I like to see what the presentations tell me about the industry, the subtext, the background. So I noticed that the speakers were very polished. They looked at the audience, they moved around the stage, they owned the space; they were in control of their shiny pretty presentations. They were sincere, compelling and enthusiastic. The slides were colorful, with attractive graphics and the right amount of text for a presentation. I’m not slamming the presenters, not at all. It’s just interesting to note that what I call “big tech” and Silicon Valley in general is very media savvy. The presenters move and talk like actors, like performers. And the place is beautiful. Keynote stage, Interop New York 2010, October 2010. Then I looked for the passion, what you might call the hype, the evangelism, the “next big thing”. Tech has always had a messianic flavor to it. It’s always been about…..wandering around in the wilderness, lost in the darkness, ignorant, and, then magically, because of a new thing, coming into the light. It’s about being saved. And this evangelism isn’t about glamorous stuff. I remember the zeal about structured programming and relational databases, which is about a non glamorous as you can get! My favorite “law” was from Dirk Gates, Amara’s Law – “We tend to overestimate the effect a technology has in the short run and underestimate the effect in the long run.” Interesting. The new tropes, cloud computing and virtualization, were referenced. Here’s a definition of cloud computing from Wikipedia – “Cloud computing is Internet-based computing, whereby shared resources, software, and information are provided to computers and other devices on demand, like the electricity grid” – http://en.wikipedia.org/wiki/Cloud_computing/. There is still a fight over the definition over at Wikipedia, but it basically means that the computer hardware and software that you need to do stuff is somewhere else, rather than being under your desk or in the computer room downstairs. You access it when you need it, on the cloud. If you store some files on a Microsoft Skydrive (http://explore.live.com/windows-live-skydrive-access-anywhere), you are accessing the cloud. Virtualization is more fun. From Wikipedia, “Virtualization is the creation of a virtual (rather than actual) version of something, such as an operating system, a server, a storage device or network resources.” http://en.wikipedia.org/wiki/Virtualization. What this means is that a program runs on a machine that pretends to be another machine, it’s “virtual”. There are technical reasons why you do this, but it’s still fun to think about – interesting that something so important could be all pretend! Dirk Gates’ presentation was a bit more technical, though still accessible. He spoke about developing an enterprise class wireless network, not the usual mix of wired and wireless components. 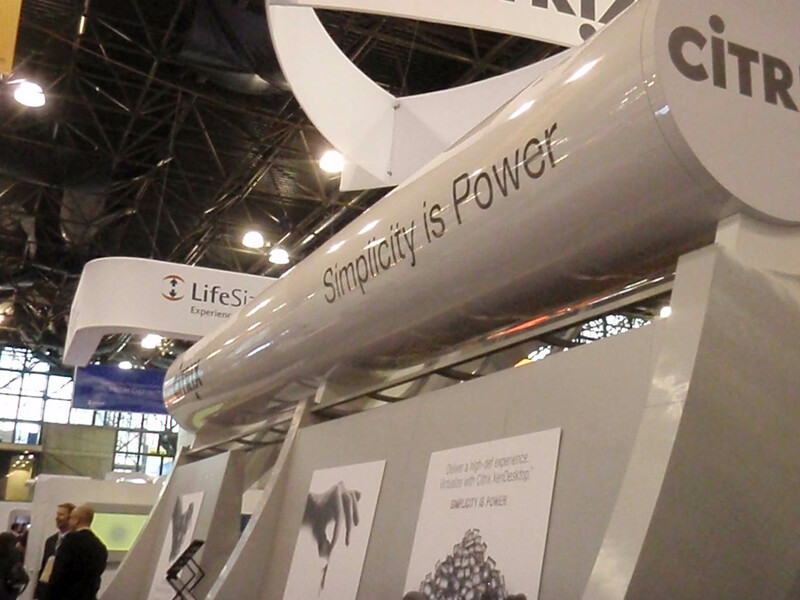 This is like the wireless network you might have in your home, but bigger, more robust, “on steroids”, as I would say. My favorite comment from him – “it’s not your father’s access points!” I felt old – my father doesn’t know about access points! Dirk also had a demo, which was pretty swell. I went to a couple of the free talks, which were good, though they tended to be on the salesy side. My favorite salesy talk was the presentation on Microsoft’s CRM, customer relationship management system, something you use to manage sales and customer support. It makes sense that it was my favorite, as the product is geared to business functions rather than operations. I went to one talk that was part of the paid content (came free with my ticket) – Key Issues in Wireless and Mobile, with Paul DeBeasi, Research Vice President, Gartner, Alex Wolfe, Editor In Chief, InformationWeek.com, Michael Brandenburg, Technical Editor, TechTarget, Inc, and Craig Mathias, Principal, Farpoint Group. The presenters addressed issues such as device management, security, wireless 4G (super fast), the threat and promise of mobile applications….all kinds of issues. Per the panel, there is a gradual migration away from the ubiquitous Blackberry phone to a multitude of phones, such as the iPhone and Android phones. Instead of being satisfied with the traditional “my way or the highway” approaches of wireless operations, employees want what they want. If the company won’t buy it, no small number of them will bring it in themselves. They bring in their own phones, or they want the company to buy them what they want. They want to put fun apps on their phones, such as the ubiquitous Angry Birds, which I talked about it on a previous blog entry. From my perspective, mobile devices are becoming a person’s “everything”, a thing for work communication, personal communication, work pastimes and fun pastimes, including games, videos and music. It makes sense that fun would be included, when what you use for work blends into the rest of your life. And people are more resistant to have the company’s wireless department tell them what to do. I recognize the significant issues with managing a wireless network, but I thought there was an interesting subtext among some of the presenters and the audience, on wanting it like the old days, when people did what IT told them to do. One member of the audience asked, rather plaintively, if he could convince people at his company to use the new Microsoft OS smartphone, rather than an iPhone, as it has a touch screen, like the iPhone. The argument is that Microsoft OS devices provide more tools for wireless management. The panel was not optimistic that he could do this. As always, the expo area was gorgeous. The booths were colorful, eye catching, futuristic. When people want to sell you expensive products in tech land, this sort of thing happens. I enjoyed walking around. 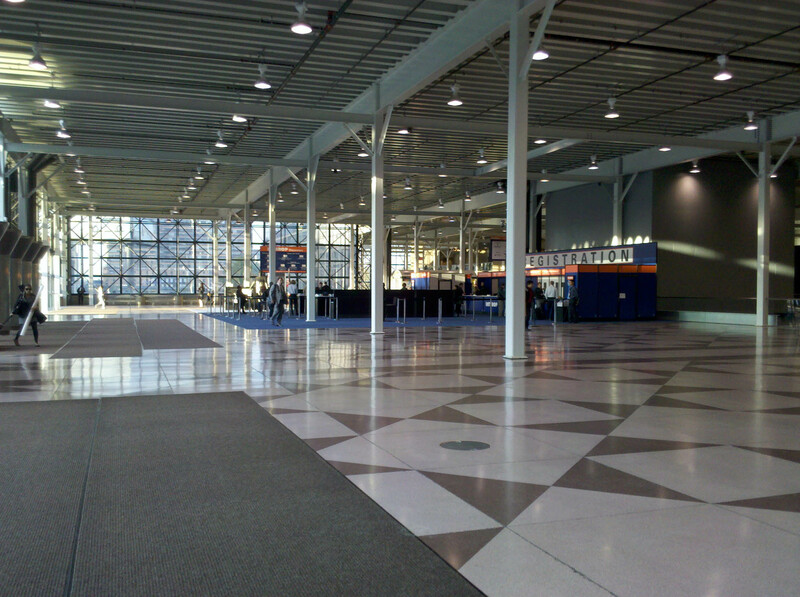 The Expo floor, Internet New York 2010. Futuristic. October 2010. I’ll conclude with saying that I scored the best swag! At the ScriptLogic booth (http://www.scriptlogic.com/) I got a token for a tee shirt, a monkey, and I won a drawing for an American Express Gift Card! 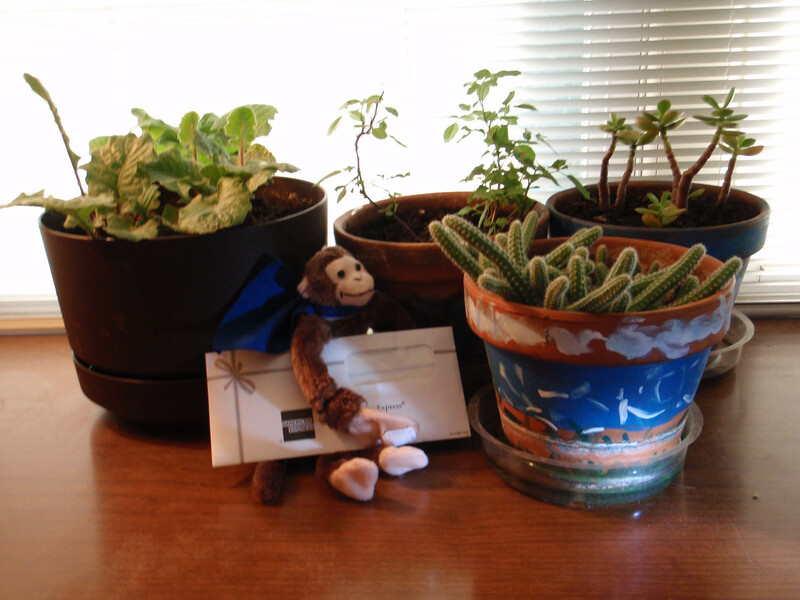 A monkey and a gift card, shown with my plants from California. 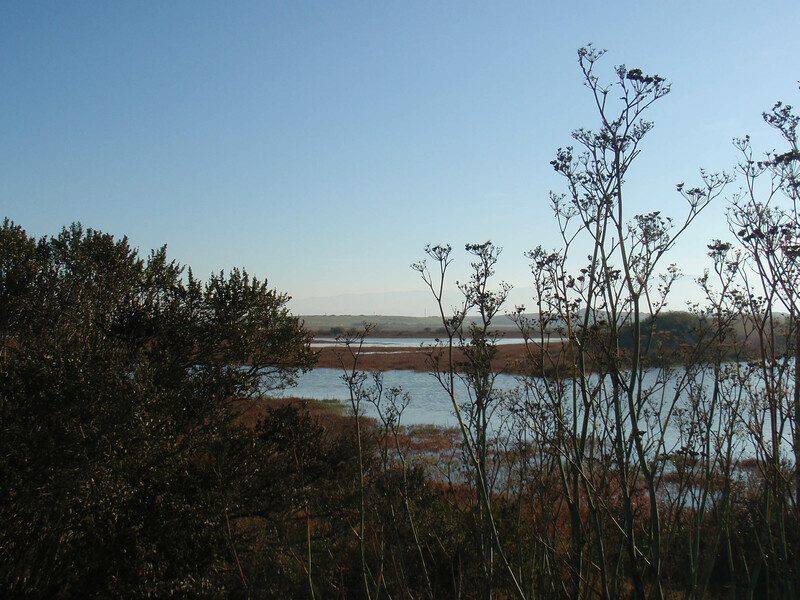 November 2010. In February 2010 I bought a Motorola Droid smartphone. I’m way into Droid love, which is like tech love, but more specific. The Motorola Droid is a wonderful thing. Even more wonderful, all this Droid love takes me back to the old days of the Palm PDA (personal device assistant!). I loved my Palm devices. I had a number of them, starting with a Palm Pilot and ending with a Palm TX. I remember the websites, the print reviews, and the endless talk about what to get for your Palm. These devices are all about apps, about what you put on them. Most of the apps I put on my Palms were either inexpensive or free, just like the Droid. I was a member of a Palm user group. 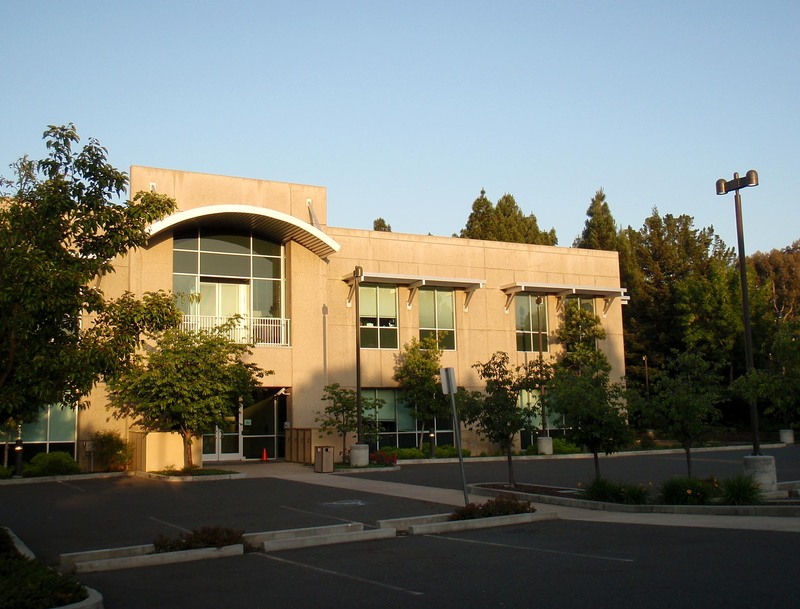 We had monthly meetings at Palm company headquarters. 2001 to 2005 were especially good years. There were refreshments — pizza, cookies, chips, soft drinks and water. There were demos of new apps using a projector, with magnification and special lighting. New devices got passed around. We exchanged tips on how to do things. My Palm user group was in Silicon Valley (northern California) but there were Palm user groups all over the world. I went to three Palm development conferences, which were extra fun because I had no business or work relationship with Palm. I took notes, using the Palm I had at the time. Memories. PalmSource Expo 2002. The general public could attend. Here’s the press release I copied to my calendar: “The PalmSource Expo, which will open its doors to the general public on Wednesday and Thursday, showcases the hottest new Palm Powered™ devices, software, peripherals and accessories – all in one place. More than 100 exhibitors present everything from handhelds, smartphones, and other mobile devices, to some of the most innovative travel, personal information management, education, entertainment, health, lifestyle, hobby and game software available for any platform”. Wow – takes me back. PalmSource Developer Conference 2004. I went for one day because I got an affordable one day pass on eBay. I still have the notes from the conference, note I took on my Palm. Reading my notes – interesting – there’s starting to be a focus on “wireless” – that too takes me back! In the old days, you got data on your Palm by connecting it to a PC. Wireless was a new thing. It was a Palm thing, now it’s a Droid thing. The Droid makes me feel the same way, though I don’t belong to a user group where we meet every month, and I’ve never been to an Android conference. For a look at Droid love, look at the droid forums on http://www.droidforums.net. People talk about the Motorola Droid and about other Android OS phones, with the save loving and obsessive zeal that I’ve seen with the Palm. And the OS is open source and you don’t have to go to one place for apps, though the Android market is quite nice. Here’s a picture, not of my Droid, but of my Droid case, taken with the Droid. This was supposed to be a temporary case. I didn’t even save the name of the company that made it. I like it so much now I’m going to keep using it. It’s colorful, it protects my Droid and it’s made with recycled products, whatever they are. 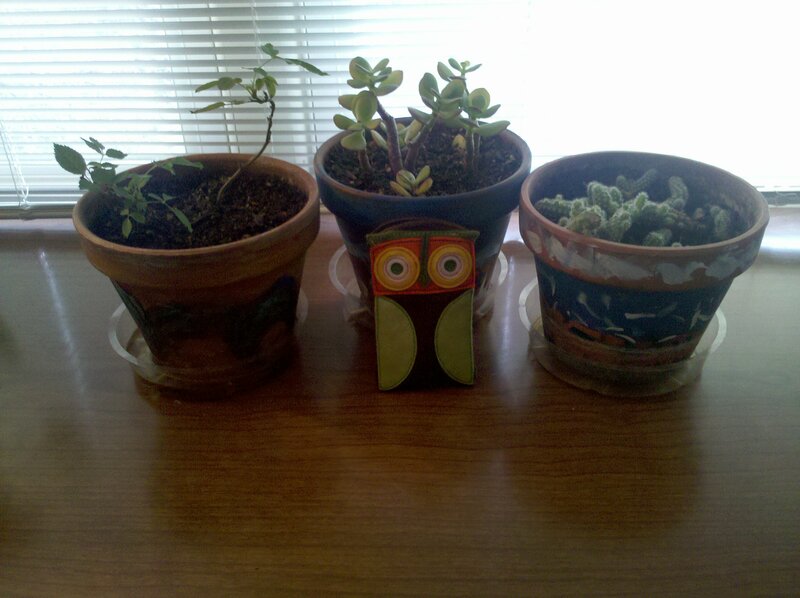 I brought the plants and the pots they are in from California. On November 18th and 19th I went with a family member to New York City to attend Interop 2009 New York (http://www.interop.com/newyork/) and Web 2.0 New York (http://www.web2expo.com/webexny2009). 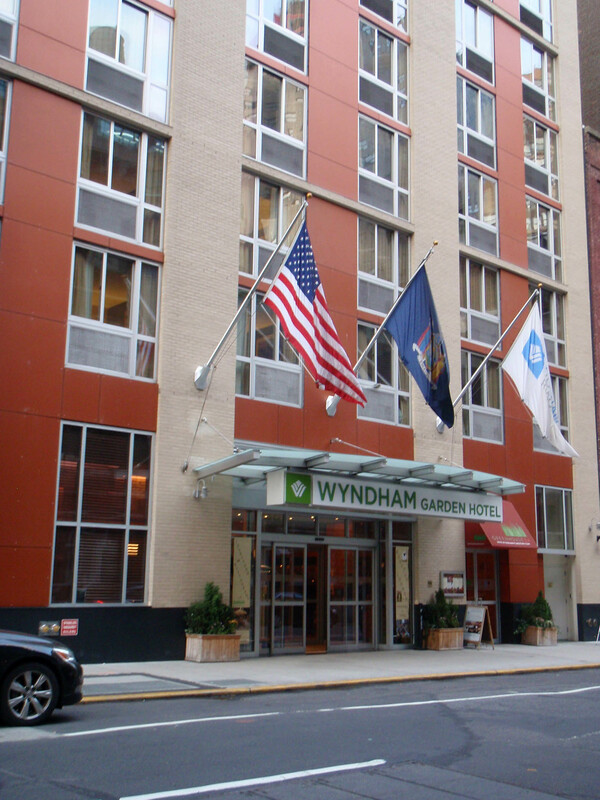 We stayed at one of the conference hotels, the Wyndham Garden Hotel Times Square South, Hotel, in the garment district of Manhattan (http://www.wyndham.com/hotels/NYCMT/main.wnt). It was a short walk to the convention center. I’m not fond of New York City, which I describe as “Gotham City and not in a good way”! I don’t like the concrete canyons and the crush of people. This time I really enjoyed myself. I loved the hotel. 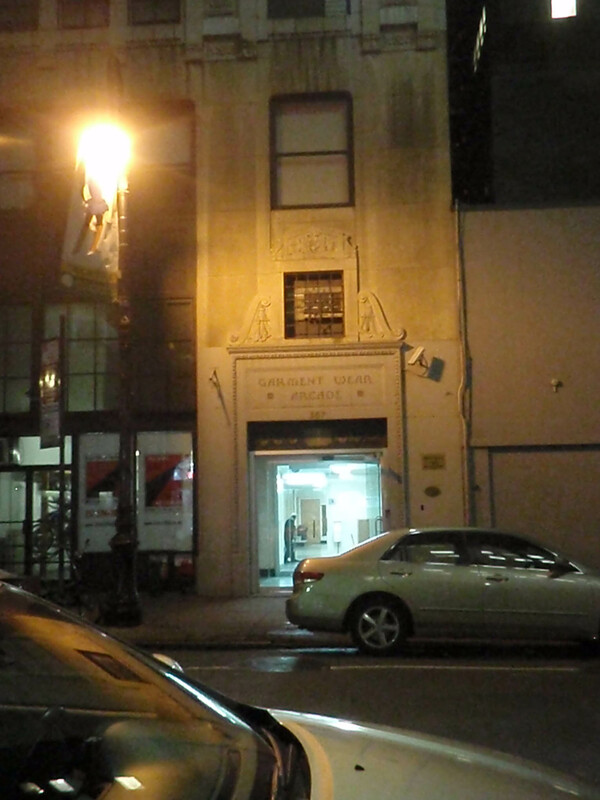 I liked my block in the garment district. I liked the walk to the convention center and the wonderful Thai restaurant across from the hotel, Royal Thai Cuisine II (http://www.royalthainyc.com). We saw a Broadway play, The Thirty Nine Steps (http://www.39stepsonbroadway.com/) and that was wonderful. I had a great time at both conventions. I had a great travel companion. I had expo passes to Interop and Web 2.0, which gave me access to the keynote speaker presentations, selected conference talks and the expo floor. Interop is about business computer “stuff”, hardware, software, networks. It’s targeted to the IT professional who has the authority to make decisions on the technical architecture and products for their company. Web 2.0 is about “the web”, with a more inclusive definition of web stuff. Think of the web as being at the center of what you do on the computer, both personally and professionally. Web 2.0 is also about collaboration, social networks, updating information on the web in “real time”. I think the term “Web 2.0” is also used to differentiate between companies that failed during the “dot com” bust, and companies still in existence doing web stuff, but that’s a personal opinion. 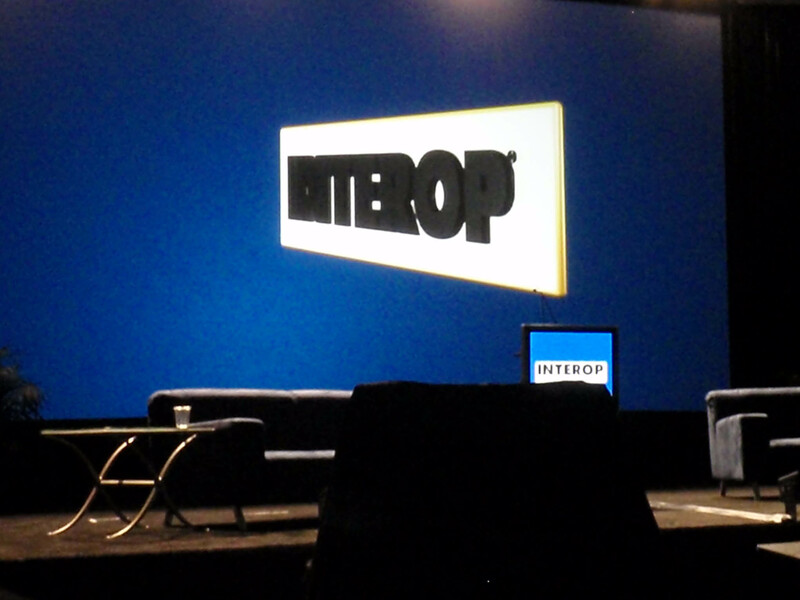 Keynote Presentations: polished and professional, both at Interop and Web 2.0. Interop had one main theme, cloud computing. Web 2.0 had no overall theme. 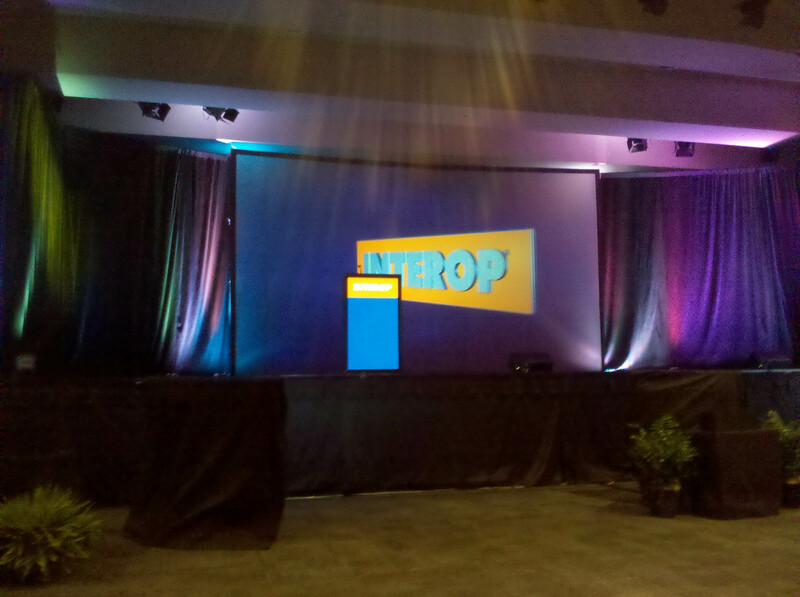 The Interop presenters were senior executives at tech companies and other institutions. The Web 2.0 presenters were a more varied group, writers, comedians, publishers, researchers, government types. Interop did have one tech columnist, David Pogue, who was really good. The presentations were all good, though the Interop presentations were consistently more compelling. I think that’s because the world has changed. Senior executives at big tech companies – they really know how to present. Along with knowing their stuff, and wanting to sell it to you, it’s a media job. Web 2.0 had more “talking heads” kinds of presentations (some funny ones too), also less polished slide content. There were some gems at Web 2.0. 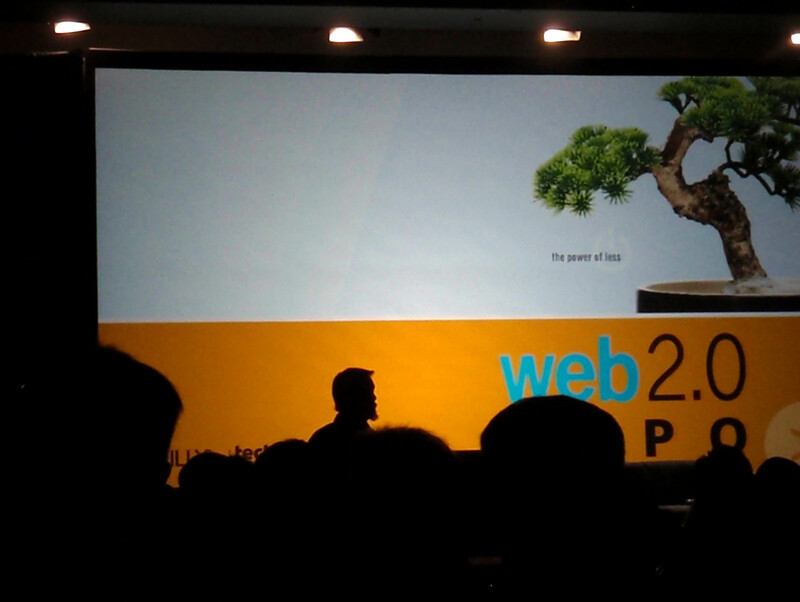 One of the most interesting presenters at Web 2.0 was Gentry Underwood from the famous design firm IDEO. Gentry talked about designing for the web. Focus: Interop is focused on what I would call “things”, big things – electronic pieces of equipment, and the stuff to run them. Web 2.0 is focused on communication. This carried over to the personal space. The fun presenter at Interop was David Pogue, who talked about and gave demos of fun applications for the iPhone, a piece of equipment, a thing. Naivety: Web 2.0 had the idea that, somehow, a speech, even a speech in front of 2000 people, was a collaborative event. At the keynote presentations a background screen behind each speaker displayed live tweets about the presentation from the audience, displayed during the presentation, real time. (Tweets are electronic posts over the internet, using Twitter). The tweet screens were distracting and annoying, and of course it went bad. At a presentation I did not attend, the tweets become personal and disruptive. At the presentations I went to, the day after the bad incident, the tweets were displayed behind the speakers, but the tweet stream was moderated, with a small time delay. I thought the whole concept of a live commentary was naïve, also a misrepresentation of what it means to give a talk in front of thousands of people. The keynotes were speeches at a conference, not a dialogue, even if people felt compelled to talk about it, electronically, as it was happening. Electronic forums have their own challenges; when unmoderated, they almost always become antagonistic and disruptive. There’s also the “class clown” syndrome. It’s human nature for people to try to get attention. Given an opportunity, one person will try to outdo the other. Generally, at a conference, you set up a presentation to maximize people paying attention, given the distractibility of convention goers. At Interop there was no attempt to make the presentations “collaborative”. For one thing, no Interop presenter would agree to such a disruptive element. I found the straightforward attitude at Interop refreshing. The attitude of the conference and presenters appeared to be “I’ll do the best job possible presenting, and I hope you’ll listen”. The Expo Booths: Web 2.0 and Interop shared the same exhibit space, Web 2.0 on one end, Interop on the other. This was good for companies that wanted to address both audiences, such as Microsoft and IBM. Expo booths are designed to display products and get you interested in buying the product. At the tech conventions I’ve been to, I’ve found the booths to be colorful and well designed. Both Interop and Web 2.0 had good booths, but the booths at Interop were better, better as in more dramatic, eye catching, bigger, with better free stuff. 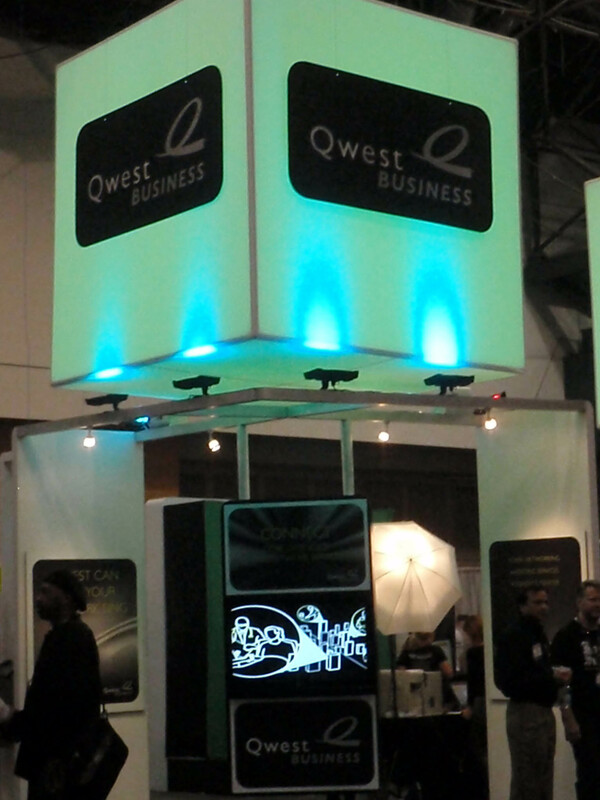 The best booth was the booth for Qwest – http://www.qwest.com/business, a telecommunications company. Advertising their “rock solid network”, you could get your picture taken as a rock star. Qwest had all the requisite props to make you look like a rock star – tattoo sleeves, guitars, mikes, hats, dark glasses, feather boas (think 70s rock). It was so much fun. Why the difference? I think the difference is due to the audience and the products. 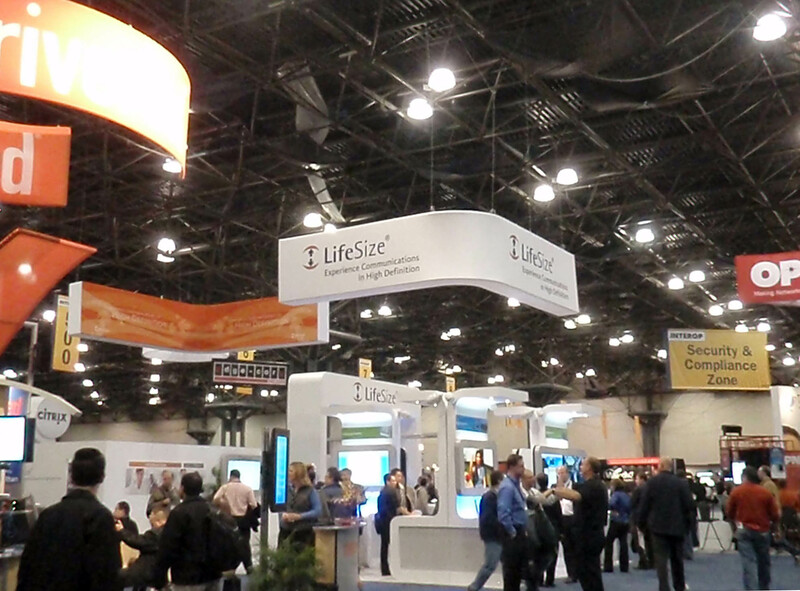 Exhibitors at both conferences were showing their products so you’d get interested in their products and spend money, but there are differences in the nature of the products and the participants. Citrix, who had a booth at Interop, can sell you something small, but they really want to sell you big stuff, in terms of price and breadth — big computers (servers), virtualization software for your whole company. So, they make a booth that looks like a spaceship. 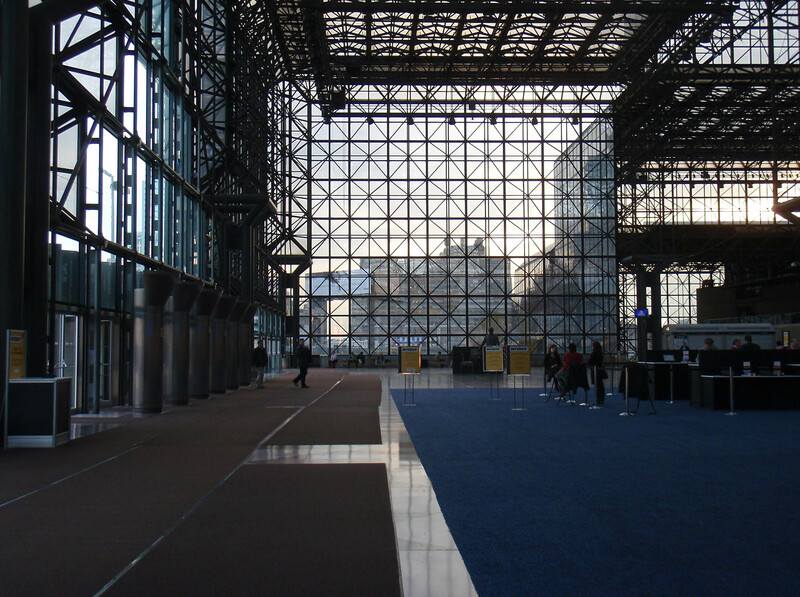 Javits Convention Center, New York City, 2009. I like the space. Citrix Booth, Interop 2009, New York City. Looks like a spaceship. Qwest Booth, Interop 2009, New York City. We got to be rock stars!